Wizards of the Coast is finally getting Advanced Dungeons & Dragons back on shelves. For many gamers in the Old School Renaissance, the rules for Dungeons & Dragons as codified by Dave Arneson and written by Gary Gygax in the original "White Box" is the only way to play. Gygax later refined those rules and published them under the imprint of Tactical Studies Rules (or TSR) as Advanced Dungeons & Dragons. TSR later moved on to 2nd edition in 1989 - and 3rd in 2000, 4th in 2008 and so on, check out the "The State of D&D" series for more on the history of the game) and no company was allowed to print older material. That is, until now. 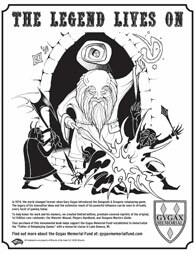 In conjunction with the Gygax Memorial Fund building a monument to the creator of D&D in his hometown of Lake Geneva, Wisconsin, the current copyright holders Wizards of the Coast are reprinting the three core rulebooks of AD&D - the Player's Handbook, Dungeon Master's Guide, and the Monster Manual. The books will exclusively be sold in hobby game stores on April 17 for $34.95 each. "In 1974, the world changed forever when Gary Gygax introduced the Dungeons & Dragons role-playing game. The legacy of his innovative ideas and the extensive reach of his powerful influence can be seen in virtually every facet of gaming today," Wizards announcement read. "To help honor his work and his memory, we created limited-edition reprints of the original 1st Edition core rulebooks." The new books have all of the artwork and text intact from the original printing, but feature a new cover created exclusively for this limited run of books. The new cover will likely allow Wizards' logo to be displayed instead of TSR's, but it's unclear from the announcement if the title will include words "1st edition" or "Advanced Dungeons & Dragons." The terms are interchangeable, but I can see reasons for and against using either of them. The announcement of this reprinting is meant to garner respect with the Old School Renaissance as well as give game stores something to sell to offset the burden of carrying 4th edition until the next D&D iteration comes out. Wizards unfortunately made at least one misstep with the announcement. The Old School Renaissance considers Dave Arneson as a significant designer of D&D and many surmise that settlements between Gygax and Arneson demand both names should be listed as co-creators of the game, although the exact stipulations are unknown. A simple edit is all that is needed, as TSR-era designer Allen Varney put it in a Tweet addressed to Wizards of the Coast: "Your press release for the AD&D reprints credits Gygax as sole creator of D&D. Might want to mention Dave Arneson." Look into getting all three books from your friendly local game store this April by using Wizards' handy Store Locator. As I've been reduced to viewing these rules only in PDF form, I will certainly purchase all three core books as soon as I can to offset any lingering pirate's guilt.